While we walked through the homes, I remember noticing all the details: the way the upstairs hallway curved, the placement of a window in an unusual but attractive spot in a bedroom, the grain in the wood of the mantel, and especially the way the house all came together to create a kind of flow and atmosphere. My mom would always ask me what I thought about the space, something that gave me so much pride. She cared what I thought. She asked how I would ‘do it differently’ or what the elements were that I found less than appealing. I enjoyed those Sunday mornings so much. My favourite neighbourhood, without a doubt, was one called Amberwood, in a rural area of Ottawa called Stittsville. It was heavily wooded and had a very robust creek that ran through it. It was hilly and rocky with winding roads and large lots that backed onto bike paths and walking trails. Our neighbours, the Schiffers, had moved there and my mom and I became enthralled by the development and the houses the developer was building there. 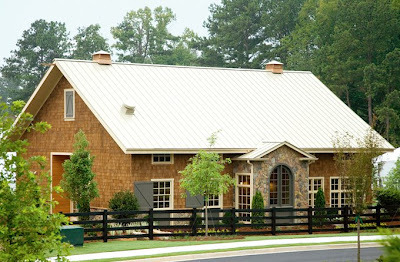 I have not yet had the privilege of seeing one of Martha’s model homes in one of the ever-expanding Martha Stewart Communities in the United States, but I am very curious about them. I should state, for the sake of honesty, that these days I am not crazy about ‘new housing developments’ or ‘subdivisions’ as they are often clinically called. I see very few today that resemble the quality and attention to detail that was evident at Amberwood. I think so much of North America’s landscape has been mistreated by developers who raze all the pleasant little hills and happy trees to the ground in order to create a flat-surfaced homage to sameness. Many of them do not preserve the integrity of the natural landscape at all and sacrifice beauty for the sake of space-saving. Many parts of suburbia look the same to me: state to state, province to province, county to county. The roads are linear. The houses are square and boring and too-closely packed together on squished lots. The planting of trees is an afterthought. Character and uniqueness are lost in many instances. Since I have not yet seen a Martha Stewart Community, nor toured any of the branded homes she and her team have designed, I can’t judge their effect. From what I’ve seen in photographs, the communities seem to be fairly typical of most American developments. This is not a criticism, really, just a bit of an indication that I was not overblown by what I saw of the exterior of the homes and the layout of the developments. However, I have had a chance to look at the floor plans of many of the Martha Stewart homes, which are based on the designs of her own homes: Skylands, Katonah and Lily Pond. The plans have some very interesting features that I really like, which I’ll discuss below. I admire Martha for taking on the KB Home partnership and designing these homes with them. I think it really does make sense, from a business perspective, for a housewares and lifestyle company to expand into the actual housing market itself. It gives Martha an opportunity to showcase some of the best features of her own homes and bring them, through affordable models, to the public. 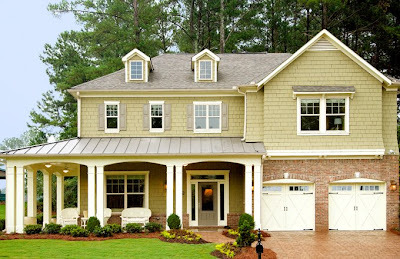 I may just have to take a drive down to North Carolina with my mom some weekend and visit some of the model homes for old times’ sake! 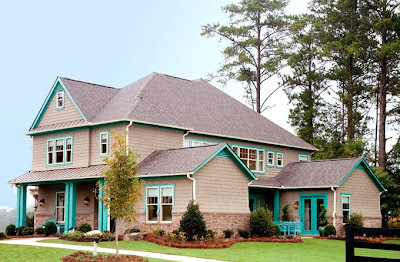 This model for the Lily Pond home in the North Carolina community is probably the closest anyone will get to living in the actual Lily Pond. It's 4000 square feet and has the signature teal trim, plus a really nice side courtyard for entertaining. I like where it is situated on the lot with an embankment of trees and a view beyond. This is a Katonah model, based on Martha's Bedford home. I like the wrap-around porch with its tin roof and the stable doors on the garage. Again, the large trees on the lot have been preserved. A beautiful colour pallette in the living room of the Lily Pond model. I like the columns and the jutted fireplace. 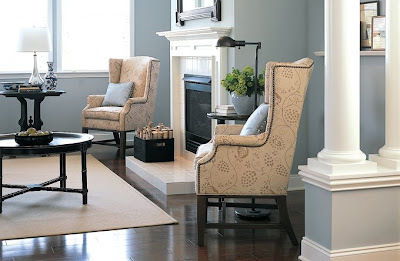 The furniture, paint and flooring is all by Martha Stewart Signature. This is my favourite feature in the Skylands plan. At the top of the stairs, on the second floor, is a hallway office with a built-in work station for two. It comes fully equipped with numerous plugs for digital cables and has plenty of storage. I like the granite countertop and the high window over the workstation. It's presentable, enjoyable and efficient. A truly large and bright kitchen in the Skylands model, fully equipped with everything a cook needs, including plenty of storage and counterspace. 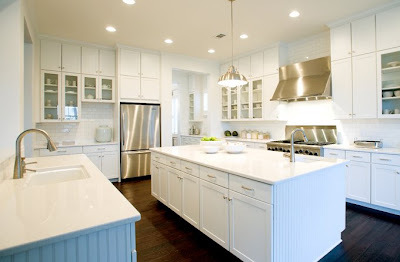 The details are lovely: the subway tiles on the backsplash, the wainscotting on the edges of the counters, the stainless steel, the hardwood floors. Beyond the kitchen you may notice a butler's pantry, or servery. Love it! The Twin Lakes community features a number of facilities, including pools, tennis courts and these stables for riding. The stables feature elements of Martha's stables in Bedford. I didn't know about these communites! I think I like the Katonah. I like the Porch and the Tin Roof. I think the first two images are photomontages. The trees are not there in reality. I like the houses but Martha and KB Home should work on sustainable new urbanist developments that bring together the virtues of the MSLO brand. The suburban housing industry had a negative impact on the American landscape and has no future.